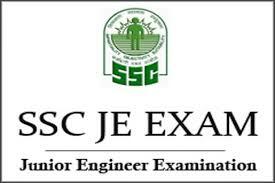 About SSC JE Exam: The exam is conducted to recruit the deserved candidates for the post of Junior Engineer (mechanical, civil, and electrical). Level: The exam is aimed at a national level. Mode: The mode of the SSC examination will be online, which is a Computer-based test. Conducting Authority: Staff Selection Commission (SSC) is the conducting authority. It is speculated that the official notification for the SSC JE Junior Engineer Recruitment for the year 2019 will be released on December 15, 2018. The SSC JE exam dates given below are tentative and it is to be noted that when the official notification is out, the facts will be updated on the website. To know more about SSC JE exam dates, admit card release date, results visit SSC JE 2019 Exam Important Dates. SSC JE 2019 Exam recruits candidates for the post of Junior Engineer in various departments as tabulated below. The approximate number of vacant seats that will be recruited through the exam is 1168. It is only an approximate number, for the accurate one we will have to wait till the official notification about the vacancies is out. To know more, visit SSC JE Exam 2019 Vacancy. The candidate must be a subject of Nepal or Bhutan. The candidate is eligible if he/she has moved to the country before 1 January 1962 with the intention of permanently settling here in India. Candidates who are of Indian origin and migrated from Ethiopia, Sri Lanka, Pakistan, Zambia, Uganda, Burma, Malawi, Zaire, the United Republic of Tanzania (with the intention of permanently settling here). Only those candidates between the age 18 and 32 are eligible to register and appear for the exam. Candidates who belong to reserved categories will get a few years of relaxation. Candidates should have a bachelor's degree in either civil engineering or mechanical engineering or electrical engineering. To know more about the eligibility criteria set by the conducting authority, visit SSC JE 2019 Eligibility. There are two steps involved while filling in the application form of SSC JE Exam 2019. Candidates can avail the application form from the official website (www.ssconline.nic.in). Step 2: Select 'SSC JE 2019 Registration'. Step 3: Applicants are required to provide basic details such as name, date of birth, residential address, category. Step 4: Choose the exam centre that is convenient to travel from the drop-down list. Step 5: Click on 'I Agree' after verifying the details and the declaration form. Step 6: If the registration is successful, the applicants will receive a confirmation page with a unique Registration ID and other details. It is important for the applicants to save it for future references. Step 1: Once the first part of the registration is complete, select 'Part II Registration". Step 2: Enter the provided Registration ID and your date of birth. Step 3: Online Payment: Pay the application fee either through Debit Card or Credit Card or Net Banking. Offline Payment: Select the offline mode payment, download the system generated challan and submit the fee by cash at any bank. Step 4: Upload the scanned documents - photograph and signature. Step 5: Click on 'Submit'. A confirmation page will be generated. Applicants are required to download the confirmation and take photocopies for future references. To know more, visit SSC JE 2019 Application Process. The application form of SSC JE 2019 Exam includes filling in the information, uploading the documents, and paying the fee. It is to be noted that women candidates and those who belong to the SC and ST category are exempted from paying the application fee. The complete list is tabulated below. Photograph: The format should be in .jpg. The size of the image should be between 4 and 12 KB. The dimensions should be 120*100 pixels. Signature: The size of the image should be between 1 and 12 KB. The image should be in .jpg format. The image dimensions should be 60*140 pixels. The application fee can be paid either through online or offline mode. Online Payment: After filling in the details and uploading the documents, the candidates can pay the application fee. They have an option to pay either through a Debit Card or Credit Card or Net Banking. The payment gateway redirects the page to the concerned bank website. Once the payment is successful, the applications will receive a confirmation page which they have to save it till the recruitment process is complete. Offline Payment: If the applicant chooses to pay the application fee offline, a system generated challan will appear which the candidates have to download and take a print out. The challan has to be filled and the application fee has to be deposited in the cash by the applicant in any of the nationalised banks of India. To know more about the form details, visit SSC JE 2019 Application Form Details. Candidates can download the admit cards from the official website. Candidates who are eligible and registered for the SSC JE examination will be issued with the admit card. The SSC JE 2019 Exam Admit Card is a mandatory document that needs to be carried by the candidates to the exam centre. The candidates are also required to bring a valid id along with it; those who fail to bring the admit cards will not be allowed to write the SSC examination 2019. Provide the login credentials, enter your Register Number and Date of Birth. Check for the details printed on the admit card. Download and save the admit card. To know more, visit SSC JE 2019 Admit Card. The SSC JE exam pattern consists of two papers. Paper- I will be a computer-based test, and Paper II will be an offline exam. Only those candidates who qualify Paper I will be allowed to appear for Paper - II. The duration of both the papers are two hours and both the papers comprise of three sections. The complete SSC JE exam pattern is tabulated below. To know more, visit SSC JE 2019 Exam Pattern. To know more, visit SSC JE 2019 Syllabus. It is speculated that the results for the Paper I will be declared in the month of March 2019. Candidates can check their results on the official website. The login credentials are important if the candidates have to view the results and download it. The page will be redirected, the candidates are required to enter their login credentials to view their scorecard. Roll number and the date of birth will be the login credentials and it is important to note that the credentials cannot be disclosed to anyone. To know more about the results, visit SSC JE 2019 Results.